Weighing scales are an important part of the industrial process. These digital scales are available in many different sizes and formats, to match the required function. They may include special types of outputs to control the functions that they are weighing. They may need to collect the weight data, or transmit that data into an associated system. Large floor scales are used in shipping and receiving departments. They may be used as pallet scales to weigh incoming shipments. Or similarly, they can weigh all of the items going into an outgoing truck for shipping manifest weights. This type of industrial scale is also used to weigh totes of materials that may be mixed or dispensed into some process system. Scale capacities can range from 5000 pounds up to 20,000 pounds or even higher. Platform scales perform the same function, although total loads are often 1000 pounds or less. Drum scales can automate filling operations. The scale is programmed for the desired full weight, and pumps or valves are controlled to properly meet these values. In applications where material may be dispensed from a drum, the drum scale can monitor the remaining weight. Cylinder scales tank scales and ton scales perform similar functions. Other popular types of industrial scales include bench scales, parts counting scales, high precision scales and crane scales. Electronic scales have been available for a number of decades. The primary technology used is strain gage load cells. Special alloy metals are machined into shapes that allow them to bend by very small amounts when a load is applied to them. Flat, foil type resistors, known as strain gages, are bonded onto the surface of the metal. As the metal bends, the strain gages will be stretched, causing their resistance to change. Measuring the change in resistance allows the industrial scale to determine the weight on its platform. During the 1970s and 1980s, electronic scales largely displaced the mechanical scales that had previously been commonplace. The American marketplace was dominated by industrial scales that were manufactured in the United States. There was also some representation by European and Japanese manufacturers. More recently, Asian load cell companies began to produce the load cells for many of the American manufacturers, either as captive subsidiaries of the American firms, or as time went on, as independent organizations. More recently, Asian companies provided the entire industrial scale, either as a private label for a well known American company, or under their own label. 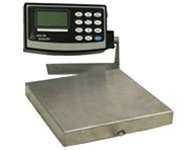 The types of scales include bench scales and parts counting scales, and a variety of smaller platform scales. Large Floor Scales are still, to a large extent, manufactured in the United States, as the cost of transportation can outweigh some other costs. But the load cells and digital indicators are usually Asian. There are some exceptions to this pattern. Some American companies specialize in certain market niches that are not as broad based as the commodity types of digital scales. For example, Arlyn Scales offers a line of cylinder scales that are popular throughout the semiconductor industry for gas cabinet installations. They also provide chlorine gas ton scales, and other tank scales, along with stainless steel and corrosion resistant scales. The same company differentiates their standard industrial scales with certain quality associated characteristics. They manufacture their own stainless steel load cells which are used in all of their scales. These special alloy, heat treated units provide superior protection from overload, and more importantly, from shock load, along with additional corrosion protection. Therefore, their platform scales, parts counting scales, cylinder scales, floor scales and crane scales are much less prone to damage during difficult industrial use. Although load cells scales represent the majority of the industrial scales in general use, some applications require higher levels of accuracy. This need has traditionally been filled by a technology known as Force motor, or force resistance scales. These electronic scales can be as much as twenty times more accurate than strain gage scales. They are also considerably more expensive, and can be somewhat less rugged. A handful of larger European and Japanese firms dominate this type of technology. A new weighing technology, known as Surface Acoustic Wave, or SAW scales, now offers a superior alternative. Invented and manufactured by Arlyn Scales, this American made technology equals the accuracy of the force motor scales, but at a cost that is similar to high quality strain gage industrial scales. As an additional benefit, the SAW precision scales are much more rugged than either of the other technologies.